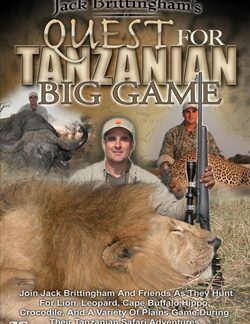 Dare to test your nerve on the Dark Continent as we face Africa’s notorious man-eaters in this thrilling quest for Tanzanian Big Game. 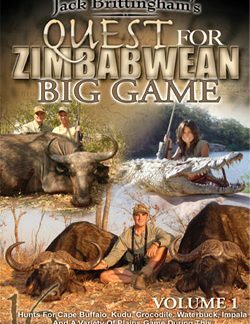 In this safari you’ll share the tension of pursuing carnivorous predators while enjoying an exciting blend of stalking a variety of plains game in over a dozen hunts. Feel the underlying fear of sneaking in on Africa’s “Black Death” as your host Jack Brittingham tests his steel on the always formidable and unpredictable Cape Buffalo. 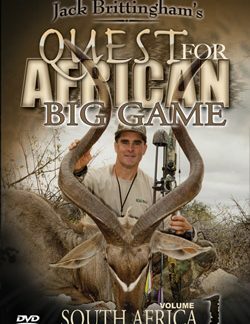 Travel with Jack across the veldt as he tries for world class impala, gazelle and zebra in the tall grass where unexpected surprises lurk both good and bad, at every turn in the trail. Experience the hollow gnawing of fear in your gut as we walk the tightrope between predator and prey while pursuing hungry lions in the grass. Tense to the ripping sound of claws as you watch some of the most compelling leopard footage ever captured during daylight hours. Plus, share in the surprise of encountering a serval cat and the rush of action that follows. And finally, crawl with Jack along the riverbanks as he tries for killer crocodiles in a watery world where they have reigned as the ultimate cold-blooded killer for over a million years. 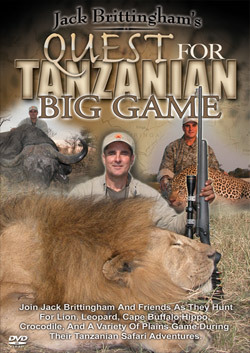 Only on the Dark Continent could we bring you this rare blend of danger and hunting excitement, spiced with the primitive allure that a genuine African safari exudes.